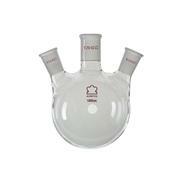 SYNTHWARE round bottom, heavy wall, three neck flasks with standard taper outer joints on both the center neck and the vertical side necks. All sizes are hand blown from tubing to ensure uniform wall thickness. SYNTHWARE round bottom, heavy wall, three neck flasks with standard taper outer joints on both the center neck and the angled side necks. All sizes are hand blown from tubing to ensure uniform wall thickness. This borosilicate glass round bottom flasks has three necks - the center neck is vertical and the side necks are 180° apart and are inclined at an angle of 20° to the vertical. All necks have Standard Taper outer joints. 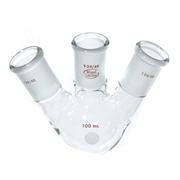 Ai 10L heavy wall, 3-neck round bottom flask with 24/40 and 34/45 standard taper joint. 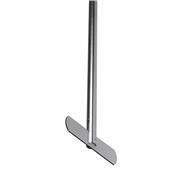 Comes with two vertical 34/45 side necks and one 24/40 center neck. 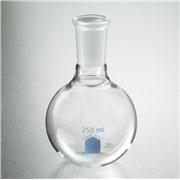 Glass material: high borosilicate glass 3.3. 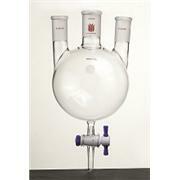 SYNTHWARE round bottom, heavy wall, three neck flasks with a bottom outlet. Both the center neck and the vertical side necks are standard taper outer joints. The lower outlet is a 4mm straight bore PTFE stopcock. All sizes are hand blown from tubing to ensure uniform wall thickness. 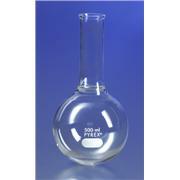 Available in various sizes, these borosilicate glass round bottom flasks have three vertical necks with Standard Taper outer joints. The side necks are 180° apart. 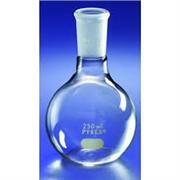 KIMAX boiling flask designed from ASTM Specification E1403, Type II, Class 3 requirements. 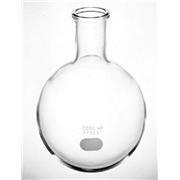 Round bottom flask with four necks arranged 3 in-line and one at 90 degrees. 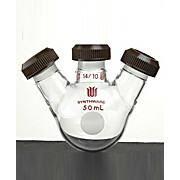 500ml and smaller flasks have angled side necks while larger sizes feature vertical necks. Available in heavy wall. 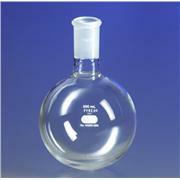 Round bottom, borosilicate flask with two necks and a side port with either a 2mm glass stopcock or a 0-3 Inlet valve. 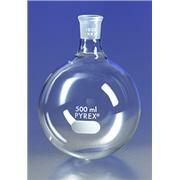 Excellent flask for reactions and NO-AIR or vacuum applications. Side port is available with either a 2mm glass stopcock or a 0-3 Inlet valve with 8mm end for use of a rubber septa. 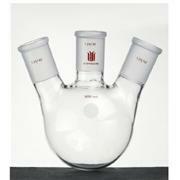 Round bottom flask, three necks with angled sides. All joints are standard taper. Available in standard and heavy wall. 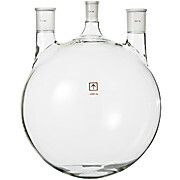 Round bottom flask with four necks arranged 3 in-line and one at 90 degrees. The three side necks are angled. 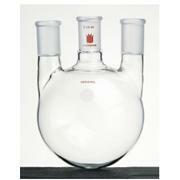 Round bottom flask with four necks arranged 3 in-line and one 10/30 joint at 90 degrees. 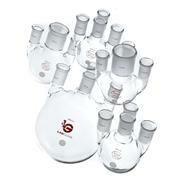 The 500ml size has angled side necks while all other sizes feature vertical necks. Available in heavy wall. 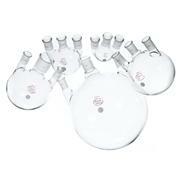 Round bottom flasks, three vertical necks, standard taper outer joints, standard and heavy wall. 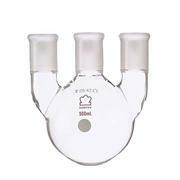 Flasks feature a flare-out directly below the center joint to facilitate cleaning and removal of stir blades. 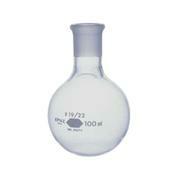 KIMAX boiling flask with a short neck and a medium length standard taper joint. Designed from ASTM Specification E1403, Type II, Class 3 requirements.